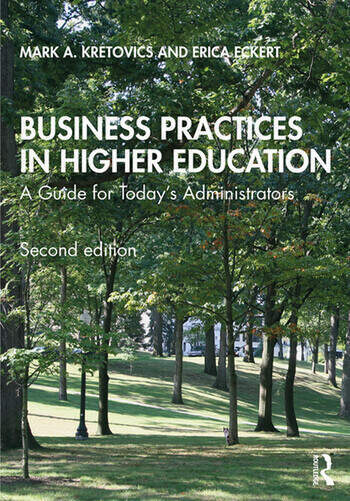 The new edition of Business Practices in Higher Education offers aspiring higher education and student affairs professionals an understanding of the fundamental business practices of colleges and universities. The authors apply business concepts and models and explain how they can be leveraged to improve the overall efficiency and effectiveness of higher education institutions. Useful examples from a wide range of institutions—including small privates, large publics, and community colleges—address macro-level higher education and student population issues, while also addressing micro-level issues for individual institutions or students. Business practices are critical to the academic, student affairs, and administrative sides of higher education. This book helps readers understand the true nature of higher education and appreciate how the academy effectively incorporates business practices into everyday work lives. 12 Where do we go from here? What is next? Mark Kretovics is Associate Professor of Higher Education Administration and Student Affairs at Kent State University, USA. Erica Eckert is Assistant Dean for Assessment and Accreditation and Assistant Professor in the School of Foundations, Leadership, and Administration at Kent State University, USA.